Trickssi is available to sit on panels relating to cosplay & consent, some types of dance (see Dance section), LGBTQIA (B), cosplay & mental illness (depression, anxiety, PTSD, CPTSD), specific games and anime of interest, and general Q&A. She can be reached at contact@trickssi.com or on her Twitter. Description Our convention community has a real problem with harassment, but "Cosplay Is Not Consent" has not been fixing that OR the stalking, abuse, and assault that can occur. We would like to show you what's really going on as a result of that phrase and offer solutions for today's conventions and online experiences. #WeBelieveYou and your voice matters for safer, more enjoyable conventions for everyone, not just cosplayers. Sponsored by the Cosplayer Survivor Support Network (CSSN). Previous Presentations This panel will debut at Fanime 2019. Description Cosplayers: have you ever been stalked, harassed, or bullied and felt like you were alone? What about abused or even sexually assaulted by someone in our community? This is a workshop for people who identify with the above to have a discussion about their experiences and discover resources for healing as well as bettering the nerd sphere. Every convention is someone's #MeToo, and we're here to remind you that you're not alone and #WeBelieveYou. Sponsored by the Cosplayer Survivor Support Network (CSSN). Description This panel will guide you through a reading of trauma and its effects on characters in the Zero Escape series by Kotaro Uchikoshi. We'll provide commentary on 999, VLR, and ZTD, and offer resources for those who may be struggling with post-trauma in real life. Sponsored by the Cosplayer Survivor Support Network (CSSN). Average Audience Size Between twenty and twenty-five people. Description What's the tea on consent in the convention community? Share a discussion with CSSN founders on the state of harassment in nerd spheres like gaming and cosplay; learn how you can support your peers and strengthen convention policies; and help us define what consent should mean to everyone. Sponsored by the Cosplayer Survivor Support Network (CSSN). Description Throughout the usually upbeat "Tales Of" series lies a darker undercurrent: betrayal, body possession, dismemberment, and more. This panel will follow the psychological journey of characters from Tales of the Abyss, Tales of Zestiria, and Tales of Berseria who have experienced trauma and confront the appropriate and inappropriate responses of the narrative to survivorship and recovery, as it relates to the needs of real-life survivors. Spoilers will be linear and explicitly noted for those who would like to hear about some aspects, but not others. Sponsored by the Cosplayer Survivor Support Network (CSSN). Previous Presentations Maple Gel Con 2017, MAGFest 2018, Ohayocon 2018, Tekko 2018 (in Tekko Gakkou), FanimeCon 2018, and Aselia Con 2019. Average Audience Size Between fifteen and forty people, depending on room size. Description Have you or someone you know (cosplayer or otherwise) ever been harassed at a convention? Have you ever wondered how prevalent an issue it still is, even with so-called "Cosplay Is Not Consent" campaign posters peppered throughout events like New York Comic Con? Find out the history of harassment culture in conventions and how organizations like the Cosplayer Survivor Support Network (CSSN) and Uplift are banding together to create a positive change for a safer community for everyone at anime/gaming/nerd conventions. Previous Presentations The current version debuted at Tekko 2018. The previous version of this panel, "Cosplay: Confidence and Consent," has been presented at Anime Mini 2017, Tekko 2017, and Colossalcon 2017. Average Audience Size Between ten and forty people, depending on room size. Description How did Japan elevate the art of ballroom dance in the mid-to-late 1990s? How is a European-crafted style of dance relevant to Japanese culture? This panel exhibits hidden gems of Japanese ballroom dance, starting with last year's manga-to-anime adaptation "Welcome to the Ballroom" to the 1996 film "Shall We Dance" and everything in between. Previous Presentations Colossalcon East 2017; presented at Anime Mini 2017, Tekko 2017, Fanime 2017, and Colossalcon 2017 in its previous version ("Shall We Dance?"). Average Audience Size Dependent on room size; attendance never smaller than 20-25 people. Description Are you a fan of sports anime and want to get on your feet? Want to find out how ballroom dance connects to Japanese culture? Learn how to waltz, tango, and rumba like the characters in the new anime, "Welcome to the Ballroom!" No partner required and all levels of experience are welcome. Previous Presentations Anime Mini 2017, Tekko 2017, Fanime 2017, and Colossalcon 2017. Selected Material Select presentation slides. Description Whether you're a beginner or a seasoned veteran, being a cosplayer is about much more than putting on a costume. In Cosplay: Confidence and Consent, you'll enhance your knowledge about enhancing wearability, building self-confidence, and ensuring fun and safety for yourself and those around you even in uncomfortable situations. Previous Presentations Anime Mini 2017, Tekko 2017, and Colossalcon 2017. Average Audience Size Between ten and thirty people. Description What do Cosplayers expect from Photographers? What do Photographers expect from Cosplayers? In this Panel, we will discuss matters involving the basics to the unexpected. From matters of consent to matters of who you want in a photographer or cosplayer. Things have gotten a little more complicated in the digital age of photography and we will do our best to sort them out! Previous Presentations Guest panelist of Greyroamer Photography at Matsuricon 2017 & 2018. Average Audience Size Between twenty and thirty people. Description This interactive venting panel led by cosplay community veterans invites you to share your "omg" moments while we commiserate in a supportive environment. Previous Presentations Guest panelist of Feytaline at Tekko 2017, Tekko 2018, and Tekko 2019. Average Audience Size Between twenty and eighty people; Tekko 2018 was standing room only. Description It started with an important question: Does Mikleo poop? Then it became: Does Eizen's hair grow? We'll investigate these and other idiosyncrasies of this mysterious race from Berseria/Zestiria, including revelations about Dezel that everyone should know. Previous Presentations Guest panelist at Maple Gel 2017. 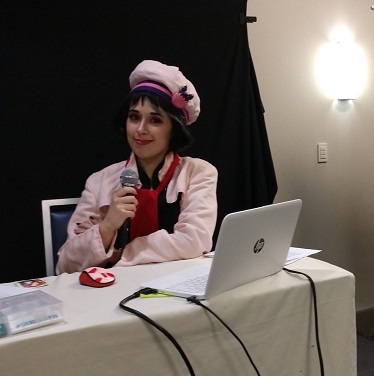 Previous Presentations Guest panelist at Colossalcon 2015, Otakon 2015, Anime Boston 2015.